A naturally well-proportioned healthy human body is beautiful; just like a clear, radiant, and glowing skin is absolutely lovely. Even women, who wear lots of make-up daily dearly want to have naturally beautiful or perfect skin. People are often confused or misled by pictures in beauty and fashion magazines, and images of celebrities on the television screen. Too few people realise that the images of their favourite celebs have been artificially enhanced by airbrushing and software programs like Photoshop – technologies that can be used to perfect anything and anyone. We recommend that our Papillon agents point this out to their customers who may have unrealistic expectations. Sadly, in reality, very few people possess a perfect complexion, one totally without blemishes, pigmentation marks, fine lines or wrinkles, sun and environmental damage, or scars. Some women have oily skins, while some have dry, under-nourished, and dehydrated skin. Others still have combination skin that is often oily on the forehead, nose, and chin, combined with normal or dry cheek areas. How does one improve the complexion that is not perfect because of what nature and one’s genes have provided, as well as a lack of skincare or the use of incorrect or harsh skincare products? While there is no quick, overnight fix, there is a solution. There are skincare products which help you to achieve improved and better, more beautiful results – a clean and clear, well-hydrated, properly nourished skin, glowing with health, achieved simply by using mild and gentle, natural skincare products. Adopting a basic skincare routine is the first step of good skincare, which should take place twice daily – first thing in the morning and last thing at night. There are three basic steps – cleanse thoroughly with an effective but gentle cleanser and an exfoliating scrub, tone to remove any remaining impurities, and moisturise to hydrate and feed the skin with essential nourishment. Cleanse & Scrub – an anti-inflammatory, anti-microbial face wash and a gentle, anti-inflammatory exfoliating face scrub to remove dead skin cells to leave the complexion conditioned, soft, and protected. Tone – tones, soothes, protects, reduces oiliness, and refreshes skin. Moisturise – Day cream reduces fine lines, prevents premature ageing, provides natural UV protection, while softly moisturising skin. Night cream does the same, and is also anti-oxidising, anti-inflammatory, and nourishing, whilst providing protection against irritation and dryness. 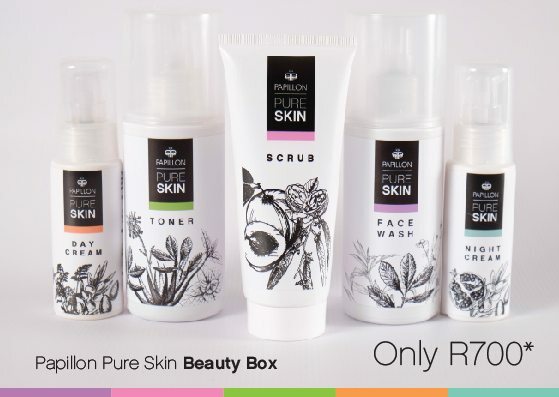 All our skincare products are made in South Africa and are loaded with superior-quality natural ingredients, which have proven natural and effective skincare properties. The prices are also remarkably affordable. It’s up to each person to make the best of the skin they’ve been given and to feel as good as they look. Armed with a little help from our mild, natural, and extremely affordable skincare products, available from our nationwide natural skincare product distributors, you can start your journey to a healthier skin. Transform how you feel about your skin and yourself with Papillon.